Melbourne has become quite a Wagner town in recent years. Opera Australia followed up its two seasons of the Ring Cycle with Die Meistersinger von Nürnberg last year. Victorian Opera presented its own Dutchman in 2015 and is about to unveil its first production of Parsifal. Having presented Tannhäuser, Lohengrin and Tristan and Isolde, Melbourne Opera now turns its attention back to Wagner’s early masterpiece. It is surely a sign of operatic good times that audiences can enjoy two fine productions of The Flying Dutchman less than five years apart. This Melbourne Opera production continues to uphold the company’s commitment to high production values, and the admirable intersection of good quality community involvement with a 100-strong chorus and professional principals and creatives. Melbourne Opera has assembled a consistently fine cast of principals, led by English bass-baritone Darren Jeffery in his Australian debut as the Dutchman and local soprano Lee Abrahmsen as his bewitched lover, Senta. Bass, Steven Gallop impresses with the vocal strength and clarity he brings to his portrayal of Daland, Senta’s father while Rosario La Spina, in his first Wagnerian role, brings plenty of passion to the character of Erik, as he laments his lost love, Senta. Michael Lapina is full of energy and vivacity as the Steersman, while Roxane Hislop is a perfect mixture of maternal love and concern as Mary, Senta’s nurse. Both Jeffery and Abrahmsen possess fine, expressive instruments that continued to deepen and mature throughout the opening performance. Against Gallop’s well rounded bass, Jeffery’s lighter baritone communicated an appropriate vulnerability, which by the final act had deepened into inconsolable anguish. Abrahmsen sang Senta’s famous ballad with fine technique, still having enough vocal reserves for her final heartfelt pleas in the third act. There was much beautiful singing from both, even if their stage presence at times tended towards understatement. To her credit, director, Suzanne Chaundy allows most of Wagner’s tale to unfold naturally in the midst of Andrew Bailey’s stark set, which is dominated by a raked wooden platform, tapering to a high peak that serves as the prow of Daland’s ship. The platform is on a manually operated centre revolve which reveals a more intimate space under the “prow” when rotated. Harriet Oxley’s costumes quietly underline the fabled nature of the scenario. Verity Hunt-Ballard schooled the chorus well in their various mimed movements (e.g. spinning, hoisting of sails) which also added to the story-telling feel. 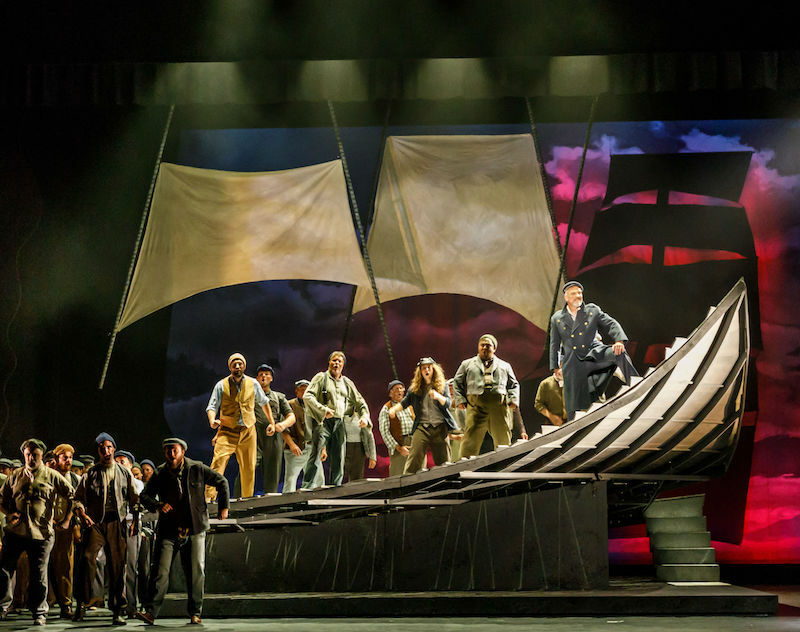 Rob Sowinski’s lighting design is broadly supportive of the story, and at its dramatic best when the pirate ship appears against a blood-red sky, but curiously static for much of the opera’s final climactic confrontation. One small cavil with the production concerns the treatment of the final moments of the work, which would have benefitted from a vital sign of the doomed couple’s transfiguration after the sinking of the ghost ship. The theme of redemption (common in Wagner’s work) needed greater emphasis rather than the suggestion that history was to repeat itself as one of Senta’s companions held the Dutchman’s portrait. Choosing to respect the composer’s wish that the opera be performed straight through without a break, well-seasoned Wagner conductor Anthony Negus (who conducted MO’s Tristan last year) ensured that the music never flagged, making the work’s two-and-a-quarter hour span pass quickly. Once the Melbourne Opera Orchestra settled down, it played with great conviction. At the outset minor intonation problems in the wind and the brass signalled some opening night nerves, and the first act also suffered from some imbalance between players and singers that righted itself as the performance progressed. Melbourne Opera is fortunate to have a large chorus, especially when performing in the vast space of the Regent Theatre. Such numbers also afforded the company the luxury of a live ghost chorus in the final act, a group that is often replaced by recorded singers. The interaction between the main chorus and these spectral figures in the final act was thrilling. Elsewhere the chorus (prepared by Raymond Lawrence) acquitted themselves well, the women having a generous, blended tone in the second act. Melbourne is indeed blessed to have MO as part of the city’s artistic landscape. Bringing a work such as The Flying Dutchman to the stage with purely private funds is no mean feat. 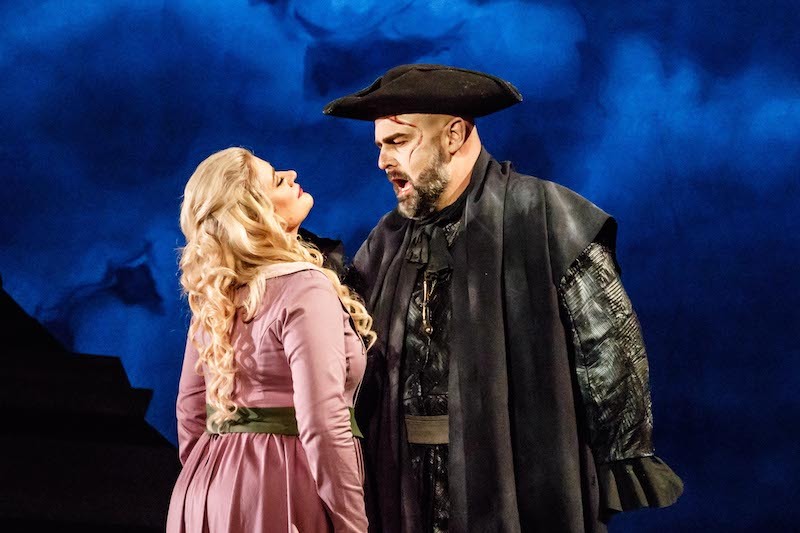 Furthermore, here is a production blessed with excellent singing from a solid cast, supported by a production that allows people into the story – in other words, an experience that comes close to the “total art work” Wagner envisaged. The Dutchman’s ghost ship is only in port for a short time. Don’t miss it!